A beautiful product. Recomend the seller. Thank you! Só demora um pouco mas vem certinho o produto! My new favorite cleansing oil! This KOSE cleansing oil is amazing! I wish that more vendors would use this small diameter pump because all it takes is two or three little drops to remove ALL my makeup. It even made short work of my MAC waterproof mascara. When you put the first drops on your face, you will immediately feel how decadent it is; it's got a great slip to it and it smells fabulous. For the quality oils that make this product such a winner, (rice bran oil, orange oil, oleic acid, persic oil, rosemary extract, etc. )the price is unbelievably low. I am coming back to order several more bottles for my friends! I highly recommend this product and I do not rate products 5 stars very often! Not really deep-cleansing, but good for sensitive areas. I have used DHC's oil cleaners and was hoping this would be similar. 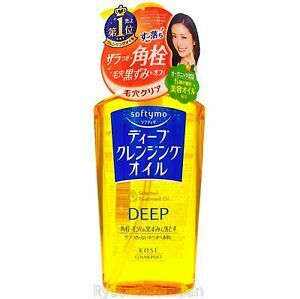 The texture is similar, like a thin oil that rinses easily, but it doesn't cleanse as well. I wear long-lasting cosmetics, and after using this product, I had to rewash my face with another product. I stopped using this for a while, since I was disappointed. Then, I realized that it is a gentle cleanser that doesn't have strong fragrances so I started using it in a private area. You can laugh, but I am pleased to find a good use for this product. I have been using it this way for a few months and have not had any issues with it. I would not recommend it for cleansing your face if you wear waterproof make-up or mascara. (It just smears the make-up into your skin.) It is useful for cleaning areas that are sensitive to chemicals or fragrances. It is useful for cleansing without stripping away your natural moisture. I wear a lot of makeup and sunscreen so I go through a lot of Oil Cleansers. This one is one of my HG because it's very affordable and does what it says. I love how easy it is to remove makeup with this. Though be vary if you don't like mineral oil in your products, this has tons of it. And make sure you shake your oil cleanser before using because I've noticed that it becomes harder to emulsify over time if I don't shake it. But I have that problem with 80% of all oil cleansers. I don't have much to compare this to other oils as never used one before or similar. It is oil you apply to dry skin after it contacted to water it become white as milk. After you need to wash you face with some cleanser. It is ok and do all as described, can't see much difference tho.